All cats are at risk of exposure to various infectious diseases, even if they spend most of their time indoors. Some infectious diseases are life-threatening, while others such as rabies also pose a public health risk. Preventing infectious disease is more beneficial to your cat than treating disease once it occurs. The cat’s natural immune system helps eliminate viral and bacterial infections. Thus, preventative vaccination is one of the most reliable and cost-effective methods of health care available to pet owners. Vaccines contain killed or weakened forms of viruses or bacteria. They work by stimulating the production of protective antibodies in healthy animals. When your cat is then exposed to a disease, those antibodies neutralize the virus or bacteria that are trying to cause an infection. Nursing kittens ingest antibodies from their mothers. These maternal antibodies provide early protection against infectious disease. However, they also neutralize the immunizing agents in vaccines. Maternal antibodies naturally decline during the first three to four months of life and eventually disappear. For this reason, kittens vaccinated earlier than 12 weeks of age should be revaccinated after 12 weeks of age. We want to give a kitten the opportunity to develop its own immunity as early as possible, but we still want to be sure those kittens that still have circulating maternal antibodies are covered as well. Rabies: Rabies is a viral infection that can affect all warm blooded animals. Once the rabies virus enters the body, it travels along the nerves to the brain. It can take days, weeks, or months for your cat to show signs of rabies. Infected cats may show unusual behavior such as being anxious, staring or having a blank look, unusual aggression, weakness or lack of coordination, running continuously, or withdrawal. Once the signs of rabies appear, the disease is always fatal. Western Pennsylvania sees a large number of rabies cases in wild and domestic animals each year. Thus rabies vaccination is legally required in all cats. Vaccination is very effective in preventing rabies. Cats should be vaccinated at 12 weeks of age, again at 1 year of age, then every 1 to 3 years depending on the type of vaccine used. Feline Panleukopenia: Feline panleukopenia is a highly contagious, often fatal disease of cats. The disease is caused by a parvovirus transmitted by contact with infected cats, their feces or environmental contamination. The virus is highly resistant and capable of surviving in the environment for months. Signs of acute infection include fever, anorexia, vomiting, diarrhea, dehydration and abdominal pain. Feline Respiratory Disease: The great majority of feline respiratory diseases result from two easily transmitted infections, feline viral rhinotracheitis and feline calicivirus. These infections result in similar illnesses, characterized by discharge from the nose and eyes, redness of the eyes, ulcers in the mouth, loss of appetite, depression, and inflammation of the upper respiratory tract. Cats usually recover in one to two weeks, although cats with feline viral rhinotracheitis can become persistently infected after returning to normal, shedding the virus during periods of stress. The vaccines for feline panleukopenia, rhinotracheitis, and calicivirus are usually combined into one shot. We recommend that kittens be vaccinated for these viruses at 8, 12, and 16 weeks of age, again at 1 year of age, and then every 1 to 3 years. Feline Leukemia: Feline leukemia virus (FeLV) causes cancer in about 20% of infected cats and also contributes to other disease by suppressing the immune system and bone marrow production. The feline leukemia virus is associated with high mortality in cats. 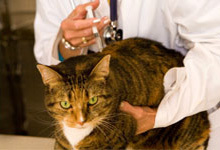 A major source of spreading the disease is persistently infected cats that appear to be healthy. All it takes to spread FeLV is contact with the bodily fluid of an infected cat. Any of these situations could put your cat at risk: social grooming, common litter boxes, shared food and water bowls, and bite wounds. The feline leukemia virus vaccine should be given to all kittens at 12 and 16 weeks of age, and to all cats who spend any amount of time outdoors. Prior to vaccination, cats should be tested for the feline leukemia virus to ensure that they are not infected.